Bill King's mission is to put up all the headstones that were knocked down or taken down in the historic St. Anne's churchyard. 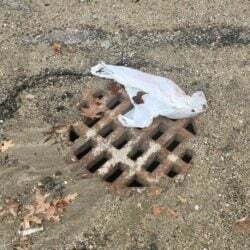 GARDINER — Sweat dripped off the tip of Hank McIntyre’s nose Tuesday as he knelt and reached into the slot he was digging in the ground. The clang of his shovel blade had announced the presence of another rock lodged in the packed soil. It might have been placed scores of years ago to help support the marker for Mrs. Henry Parker’s grave. The slate headstone lay facedown on the ground in the churchyard of the former St. Anne’s Church on Dresden Avenue, waiting to be set in place again. A corner of the stone is missing. It might have broken off in the ground, or it might never have been there at all. While McIntyre dug, Bill King puttered nearby, leafing through the three-ring binder that contains many of the pieces of the puzzle the two men are trying to solve. “We do a terrible job taking care of our graveyards. Most of them are private. They’re not city graveyards; that’s where the problem is,” he said. Births and deaths are recorded by government agencies, but no one tracks who is interred in privately owned burial grounds or where those graves are located. Often, when the record keeper dies, any information that person collected is stashed in an attic or basement or discarded. King, his wife, his brother and his brother’s wife visited the churchyard about 25 years ago to locate the graves of his ancestors, Gideon and Dorcas Gardiner. Gideon was a first cousin of Sylvester Gardiner, who established Gardinerstown Plantation in 1754, and Dorcas Gardiner is believed to be the first person interred in the churchyard. King said he hasn’t been able to find anyone buried there earlier than Dorcas. St. Anne’s churchyard is just one of the destinations in New England that King has visited, tracing his family back through generations to the era before the American colonies declared their independence from England in 1776. The headstone of Samuel and Sally Jewett is re-erected Tuesday at their grave in the churchyard at the former site of St. Anne’s Church in Gardiner. Bill King, left, and Hank McIntyre set the stone on a pedestal while Logan Johnston lowers it from his tractor. When King returned to St. Anne’s churchyard seven years later, many of the headstones were scattered on the ground, some pulled from bases. Eventually, they were all piled along an edge of the churchyard. 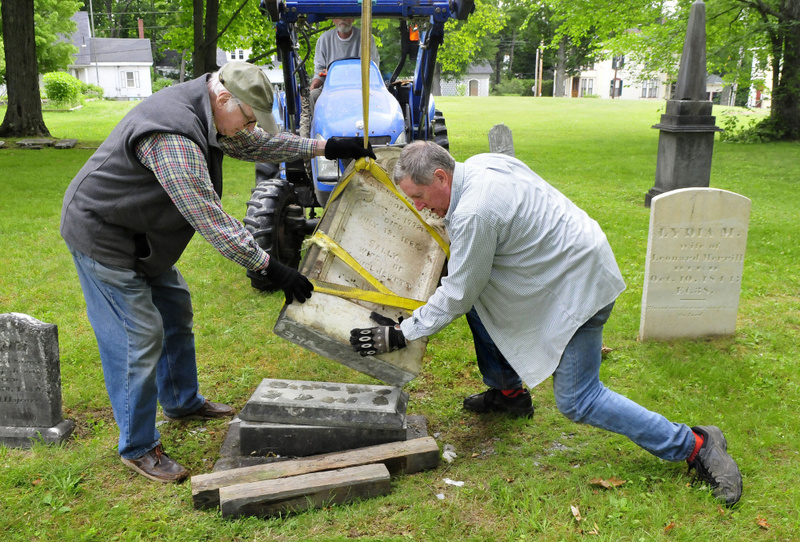 Now King and McIntyre are relying on scarce records — mostly just the photos King’s sister-in-law took that day a quarter-century ago and the work of some volunteers who helped locate some of the graves — to set the headstones back where they belong. “Those are my ancestors,” King, 85, said, indicating the line of headstones of the Gardiner family. The Parker headstone was the second one placed Tuesday. A bit more than an hour before, King and McIntyre conferred with Logan Johnston about the placement of the stone of Samuel and Sally Jewett. Johnston had driven his tractor into town to help lift the stone, estimated to weigh 400 pounds. McIntyre had mixed a bonding agent in a foil pan and spread it on the two pieces of the headstone’s base. Once in place, the headstone’s weight would cement the bond and keep the grave marker in place. 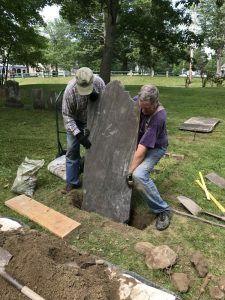 Getting the headstone in place required conferring, re-wrapping the strapping on the stone and several attempts before the stone settled into place, leaving Johnston free to return to his farm and fret about the humidity and haying conditions. 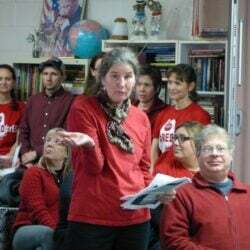 McIntyre, 66, a member of nearby Christ Church Episcopal, volunteered to help King in his quest to return the headstones to where they belong at the behest of Jody Clark, the church’s organist, who knew what King was attempting. “I’m retired and I was looking for something to do,” he said. Spread around the gravesite were three kinds of shovels, a wooden board, a pair of loppers to cut tree roots, a level and a variety of trowels. It’s almost like archeology, McIntyre said. The headstone of Samuel and Sally Jewett is re-erected Tuesday at their grave in the churchyard at the former site of St. Anne’s Church in Gardiner. 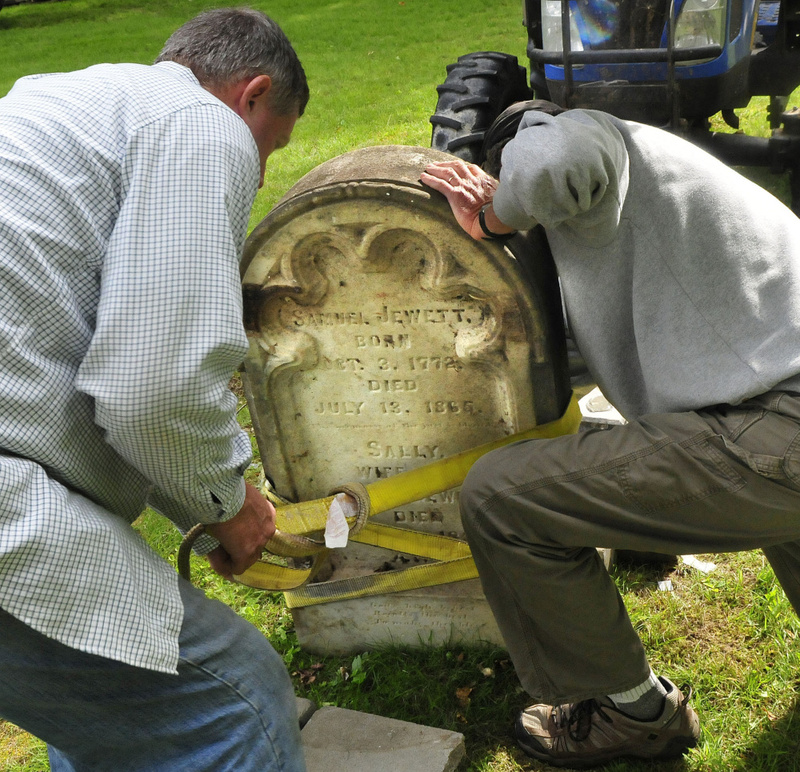 It took a few tries to align the stone on the grave pedestal as Hank McIntyre, left, and Logan Johnston strap the heavy stone. Sometimes months pass before they are ready to place headstones. He dug down about 2 feet before he and King lifted the stone into place. The guideline they are using is that about one-third of the stone’s length should be buried. While King held the stone in place, McIntyre filled the space around it with gravel, sand and water before backfilling the rest of the hole with the soil and turf that he had set aside on a tarp. To walk in the churchyard is to touch history and be reminded that what is dryly and dispassionately retold between the covers of books was a messy reality. St. Anne’s churchyard, adjacent to Christ Church Episcopal and its own churchyard, was next to the site of Gardiner’s original Episcopal church. Not long after St. Anne’s was built, it burned to the ground. 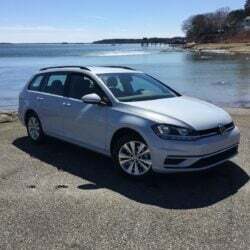 Historical accounts in sources such as “The History of Gardiner, Pittston and West Gardiner with a sketch of Kennebec Indians, & New Plymouth Purchase” place the blame on Henry McCausland, an early settler in the area and a Revolutionary War veteran. “McCausland … at length became insane, and went wandering about the town, though he was always considered harmless,” according to the written account. Historians say McCausland had a vision that he should make a burned offering of the church and sacrifice its pastor. While he succeeded in burning down the church in August 1793, he wasn’t able to complete his plans to kill the Rev. Joseph Warren. Instead, he settled on another victim with the same last name, Abigail Warren, whom he did kill in October that year. He confessed his guilt and was held in the Augusta jail for 36 years until his death. He would accept a penny or two from visitors in exchange for his stories. The headstone of Mrs. Henry Parker is set in place Tuesday at St. Anne’s churchyard. 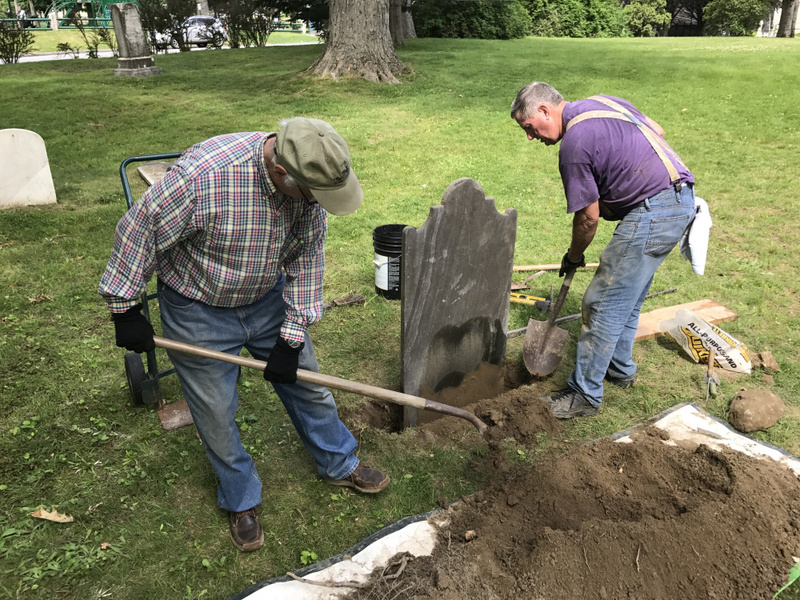 Bill King, left, and Hank McIntyre are working to erect all the headstones that have been either knocked down or removed from their bases in the historic Gardiner churchyard. The congregation eventually outgrew the building that replaced it. Christ Church, at 2 Dresden Ave., replaced that one and still stands today. The first stones that King and McIntyre placed were those of the Gardiners. Not far from Gideon and Dorcas Gardiner in the line of headstones is a marker bearing the name of “Mrs. Phebe,” referring to Phebe Cartwright Gardiner Sager. “She was an interesting woman. She was married three times,” King said. She was born in Nantucket and sent three of her sons to the island off the coast of Massachusetts to learn the whaling trade. Phebe stayed behind and had her own business downtown as a seamstress in property where the Milliken building now stands. King said that was also the site of the family home where she died. That’s why her marker bears no last name, and why she’s buried close to her second husband, King said, and not near her third husband. In fact, Joseph Sager was tried for murder and convicted of poisoning his wife in 1834 and hanged on Jan. 2, 1835, in Augusta. It was the only hanging to take place in Kennebec County, and it was attended by thousands. Historical accounts say friends took Sager’s body to Hallowell to try, unsuccessfully to revive him. Sager is believed to be buried on an island in a pond in Winthrop in an unmarked grave. King and McIntyre called it quits Tuesday after two headstones. 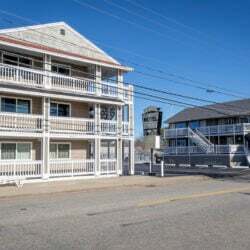 They might return during the second week in July to continue their labors. What they have accomplished so far is the result of about three years’ worth of work. Not all of it has been in the churchyard. 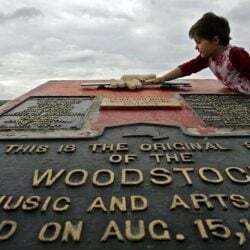 They have cleaned and repaired stones over the winter, and King has spent time researching, with the help of Dawn Thistle, specials collections librarian at the Gardiner Public Library and in the library’s archive. King estimated there are 16 or 17 more headstones to go. “We may get about half those stones done. The other half, we don’t know where they go,” he said, adding that they might end up eventually in a line at the edge of the churchyard. Trees have grown up in the last century and they might cover some of the graves. While the project to date has cost only a couple hundred dollars, finding some of the other graves might cost significantly more. 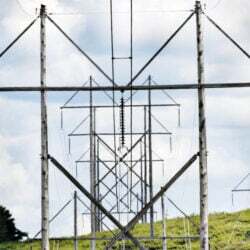 King said he’s considering ground-penetrating radar, and the cost of that could run to several thousand dollars. But even that’s not going to put all the puzzle pieces in place. “There are seven or eight other people listed, but we don’t have stones for them,” he said. Cities and towns started establishing public cemeteries in the 1850s and 1860s, and some families relocated their loved ones, so the stones and the bodies might have been moved. King hopes someone has photos of the churchyard tucked away somewhere that would indicate where the remaining headstones belong. He’s been through the Archive Room at the Gardiner Public Library with little luck. He said he can’t believe that the photos don’t exist. The churchyard was bounded at one time by the junior high school, the high school and the parish hall; and the events that would have taken place in all three buildings seem likely to have inspired photos to be taken. They have been asking around for photos for about six or seven years with little response. Even so, the fun is in the pursuit of learning more about the lives of the people whose most tangible mark on the world is brief recitation of their vital statistics on their headstones. Bill King, left, and Hank McIntyre backfill the hole McIntyre dug Tuesday for the slate headstone of Mrs. Henry Parker in St. Anne’s churchyard on Dresden Avenue in Gardiner. As for himself, King said he knows where he will be buried: in a graveyard on his property in Woolwich, where his late wife and her parents are buried. “It’s been there since 1822,” he said, adding that the town was unaware it was there. If anyone is looking for Bill King a century hence, with any luck they will have to go only as far as the Woolwich Town Office. “I’ve agreed to give them a list of everyone in the cemetery,” he said.